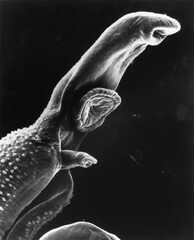 Scanning electron micrograph of a schistosome parasite, which enters the body through the skin of persons coming in contact with infested waters. The adult worm lives in the veins of its host. This parasite has been associated with some cancers. The parasite is magnified x256 in this photograph.